The case of a laptop robbery that turned into a homicide in Oakland last month still does not have a suspect. Now the Oakland Police Department is seeking the public's help in finding a person of interest in the case, a man who was seen in surveillance footage as shown above shortly before the crime. KRON 4 reports that the man is an African-American male, between the ages of 25 and 30, and is six feet tall. At the time he was wearing sunglasses, a gray hooded sweatshirt, and dark colored sweatpants. The man allegedly took the laptop of 40-year-old musician Dave Deporis on the afternoon of August 9, while Deporis was sitting at an outdoor table at Arbor Cafe in the Temescal neighborhood. 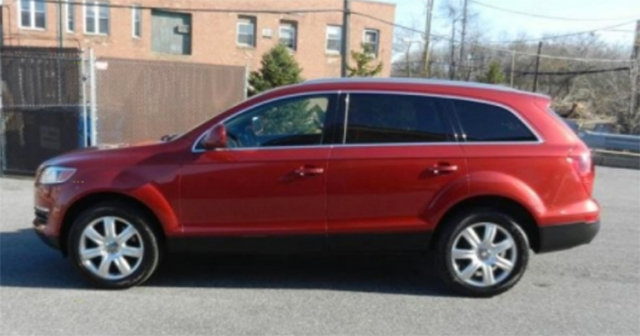 Because so much of his music was stored on the computer, Deporis chased after the thief, who jumped into a red, mid-sized, four-door Audi SUV, similar to the one pictured below. In the course of the pursuit, Deporis was dragged by the car, and was found suffering from life-threatening injuries on the 400 block of Rich Street. “Dave always was just an all-in artist and the community needs people like that to keep us honest," said friend Scott MacDonald to CBS 5 the day after the tragic incident. Oakland police are offering up to $15,000 for information leading to an arrest in Deporis's killing. Anyone with information is asked to call police at 510-238-3821, or Crime Stoppers at 510-777-8572. Follow SFist on Twitter and Instagram, and like us on Facebook. You can also get the top stories mailed to you—sign up here I Do...Until I Don't could have been better.